In Lang Suan, there is an old temple, located on the river in a cave. Unbeknownst to us, the temple grounds have been overrun by monkeys and they are the most ridiculous bunch of hooligans I have ever encountered. A person could sit for hours just watching these little guys bounce around the trees, vines, and rocks, sometimes screaming and whooping at each other, but always doing something silly. I had been to this “Monkey Temple” one time before. I had never been inches away from a monkey before, let alone be surrounded by them. 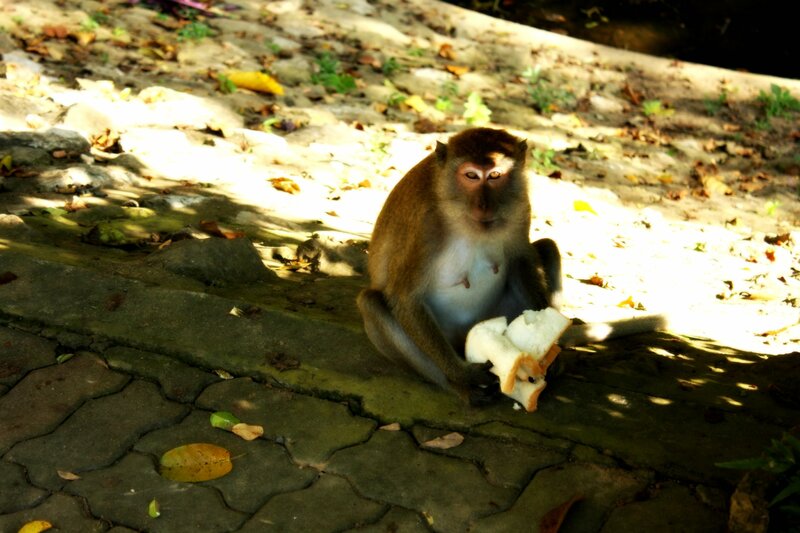 I wasn’t sure what to do around them and when James gave me a bag of cookies to feed to the monkeys I was hesitant. It didn’t matter how careful I was with the bag, it wasn’t in my hands much longer. When I was getting ready to feed one of the bigger ones, he quickly reached out and grabbed the bag from me and ran off. I couldn’t believe it! I was completely duped and that little sneak pilfered a full bag of cookies! Well this trip I was determined to keep my treats long enough so I could feed the monkeys myself. I had brought with me three pieces of bread that I was planning on splitting up so I could spend some quality time with the monkeys. While I held the plastic bag in my hand, I was shooting one of the monkeys that had decided to model for me. Out of the corner of my eye, I spotted a curious monkey swiftly charging towards me. Surely, he would stop, I thought. And perfectly tore the bottom of bag and collected his prize: all three pieces of bread. I stood awestruck with the now limp plastic bag. James was hysterically laughing. We couldn’t believe it happened again. Just more evidence that monkeys are a little more like us than we thought.